Language Systems Lifestyle! : Discover LA: It's More Than Just A Library! Where can you see an early edition of Shakespeare, sip tea in a Japanese garden, and roam through a barren desert, all in one afternoon? Established by a wealthy financier in 1919, the Huntington Library and Gardens in San Marino houses many rare books, famous works of art, and over 120 acres of botanical gardens. Although it's known as the Huntington Library, it's more like a museum than a library. The collection includes many rare books, including a copy of the Gutenberg Bible and a rare manuscript of Canterbury Tales. The art collection, housed in a mansion that was once the home of the Huntington family, contains many famous paintings and sculptures from 18th century England and France. 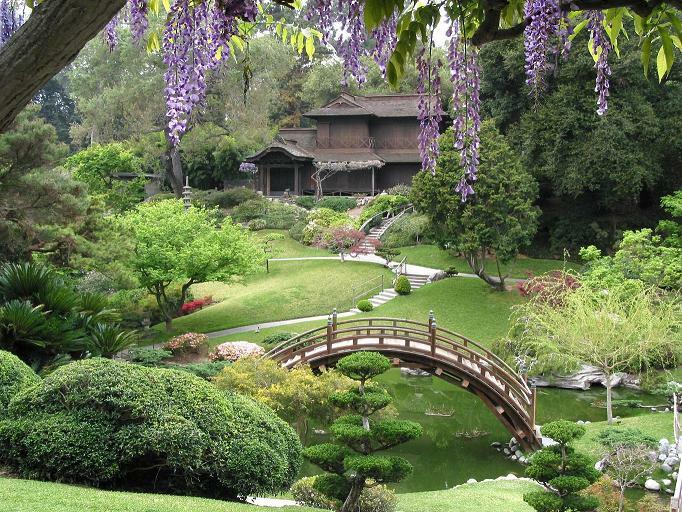 You could spend hours roaming through the extensive landscape gardens at the Huntington Library. Perhaps most famous is the Japanese garden, where cherry blossom trees overlook a serene pond brimming with colorful koi. The desert garden nearby is an arid landscape, featuring cacti and succulents native to Southern California. On weekdays, tickets to the Huntington Library and Gardens cost $20.00 for adults, and $10.00 for students. Admission is free on the first Thursday of every month, but you must reserve tickets in advance.